Improve Your Social Skills is a beginner’s guide to getting socially good by Daniel Wendler. Daniel Wendler says that he was very socially awkward growing up, but he improved immensely. With a growth mindset indeed you can get better at anything. Social skills included. Wendler says the first step to overcoming social anxiety is to understand the difference between physical fear and true fear. True fear is because something in your environment is truly dangerous and your fear is justified. Physical fear is the activation of the fear system without any real danger. And, of course, social anxiety is a physical fear. The author gives you a very nice crash course on body language. I totally agree with him when he says that there are thousands of different expressions, but the only two signals you need to understand are comfort and discomfort. He says when you learn that, you can gauge your interaction and adjust accordingly. Seeing discomfort? Start troubleshooting or cut your conversation short, maybe you’re boring them. Comfort signals? Green light, keep going. I invite you to check his book for the details. Daniel teaches you how to manage conversations effectively. He introduces the concepts of invitation (a question) or inspiration (saying something that will make the other person want to jump in). Only invitations will make the conversation like an interview. Only inspiration is hard. So the author proposes a mix. Check the book for some good examples. Just a note from my side, I like the idea of Mark Manson in Models saying it’s good to replace questions with statements. A question, he says, begs for an answer. I agree with Daniel’s suggestion. He says the first thing you should look at, is if the groups are open or closed to new people joining. Closed means they are huddling and there’s little physical space to actually join. Open means they are facing the larger group or it’s physically easy for new members to join in. To join a group, he advises you either introduces yourself directly or indirectly. Check the book for the details on how to execute both, it’s quite good. Daniel stresses the need for empathy to succeed socially, with which I wholeheartedly agree. And he proposes you check out the book Social Intelligence. The author says that empathy is partly innate, and partly you can grow it. Daniel says first you need to understand yourself and allow yourself to feel the feelings you’re feeling (check Daring Greatly), and then you can move to empathizing with others. 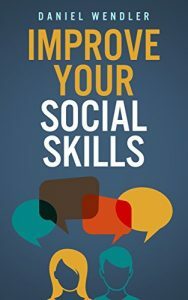 Improve Your Social Skills also has chapters dedicated specifically to where and how to meet friends and how to get girlfriends. And how to nurture and develop both friendships and girlfriends. We come from very different perspective and experiences when it comes to dating, but I respect Daniel’s opinions. He proposes to start as friends, and it’s an interesting opinion because he says that’s the only way to be attracted to the real personalities. Check the book for how to exactly do that. If you are more concerned with what your partner can do for you than with what you can do for your partner, then you should not be dating them. After having read a bunch of women’s dating books all about playing games, I really appreciated Daniel’s point of view. That’s indeed how the best relationships are. I love how Daniel simplify eye contacts, which in many resources is made to sound very complex. Simply hold eye contact with them more or less as they hold eye contact with you. In spite social skills are some of the most important abilities one could develop, there are few good books on the subject out there. And I find Improve Your Social Skills to be one of the best beginner’s guides. It’s a different style than The Power Moves, which focuses not only on social skills, but also on the darker side of human nature. I don’t know the author personally, but I have a very good impression of him. He communicates with solid morals and ethics and he’s a guy I could see myself being friend with. The fact he overcame Asperger’s Syndrome to become socially effective gives Daniel a strong perspective on working on the basics that most other authors don’t have. And, if I may add, it’s also a testament to human capabilities: a beautiful message from Daniel there.